Hoof Rot: What Is It and What Can We Do About It? 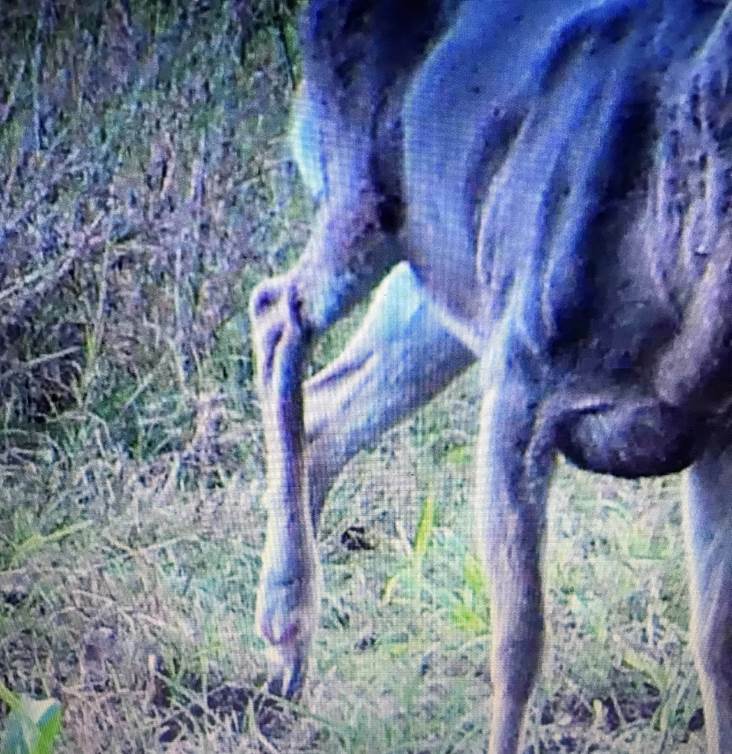 Home > Whitetail Deer Management > Hoof Rot: What Is It and What Can We Do About It? Hoof rot is just as ugly as it sounds. It’s a bacterial infection that deer can get when an open wound allows bacteria (Fusobacterium necrophorumto) to enter their flesh. When the bacteria persist, the foot becomes enlarged and the bones of the hoof are literally eaten away by the toxicity of the bacteria. It is a well-known disease in the livestock industry, but has recently been happening more often in free-ranging deer. See this article from QDMA regarding a recent outbreak in Kansas. So why is this year worse than other years? Most evidence suggests that a prolonged period of wet weather allows bacteria in the soil to proliferate. When deer live in wet soil for long periods of time, their hoofs can more easily become damaged as a result of normal walking around in their environment. Think about when you stay in a pool for too long and your skin gets wrinkly, it is easier to get a cut when your skin is in that water logged condition. 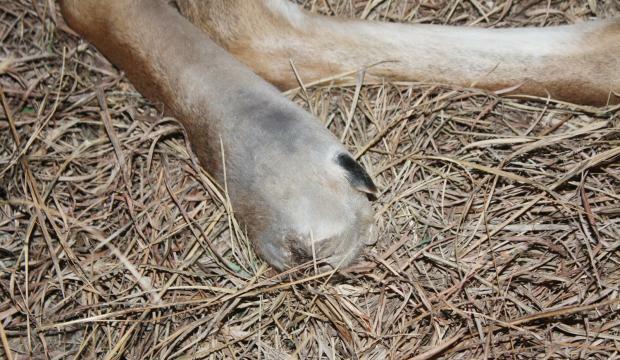 For deer, once they get a cut, there is an opening for the bacteria that cause hoof rot to enter their flesh. The severity of the rot mirrors the severity of the initial cut. A minor cut may cause minor swelling and a normally healthy animal can overcome the challenge. A more severe cut, however, will cause more swelling and if the bacteria works its way up the leg and into the blood stream, the deer has little chance of surviving. Here is a trail cam picture I received from a hunter in Kansas. You can see from the saggy appearance of the hide that this deer is not healthy. It also looks like he has lost his hoof. Only time will tell if this deer will survive. Anytime a wild animal fights an infection, energy that would normally be allocated to maintaining their body is instead used to fight the infection. Like any other disease challenge, the best management strategy is to make sure your deer are as healthy as they can be before an outbreak occurs. This means using minerals and supplemental feed along with proper habitat management to ensure that nutrition is not a limiting factor for your herd. As a biologist, I question if mineral deficiency has a role in the epidemiology of hoof rot. When an animal cannot acquire enough minerals for maintenance, the immune system is the first thing compromised. With a compromised immune system, the chance of survival from a bacterial infection is severely reduced. If you are interested in testing the circulating mineral levels of the deer on your property, check out our Liver Analysis page. We will send you an ice pack, a cooler, a sample form and a return UPS label so all you need to do is harvest a deer and save a fist-sized portion of the liver. If you notice symptoms of hoof rot on your property, look at places where there is a lot of mud. If that mud is around one of your feed sites, it’s time to move that feeder. Try and find a place on the top of a hill that will not accumulate water when the feeder is heavily used. If your feeder is full and too heavy to move, try placing rubber mats under feeders to prevent mud from touching deer at feed sites. If you harvest a deer with symptoms of hoof rot, contact your local wildlife agency to have the foot tested. Most state agencies have funds available for animal disease testing, so don’t be concerned about the expense.